Moderna’s potential could merit an $8 bln IPO, even if investors often underestimate the time and cost of developing new drugs. Amid waning bullishness, the firm is wise to heed the finance commandment of the cash-hungry sector – when hors d’oeuvres are being passed, take two. 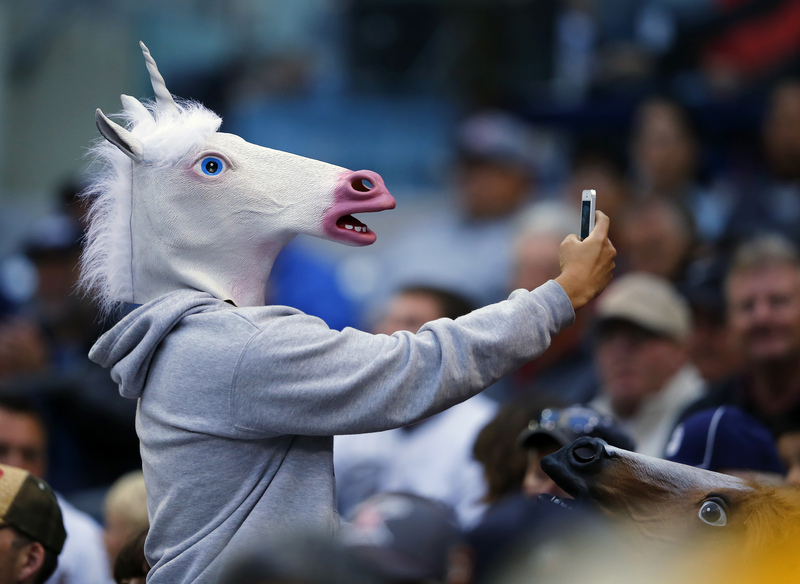 A baseball fan wearing a unicorn mask takes a picture of himself with his phone as he attends the Interleague MLB game between the San Diego Padres and the Toronto Blue Jays in San Diego, California June 2, 2013. Moderna said on Nov. 28 that it expects to raise up to $522 million in its initial public offering. The company, which develops drugs based on messenger RNA, expects to sell 21.7 million shares at a price of $22 to $24 each. The top of the range would value Moderna at $7.8 billion, which would make this the largest biotech IPO ever in the United States. The company has 21 ongoing programs of which 10 are in the early stages of clinical development. The company has raised $2.6 billion in several funding rounds since it was founded in 2010. It had $1.2 billion in cash on its books at the end of September. The company’s operations used $240 million in the first nine months of 2018.